It was the MTV's Video Music Award last night and I was tuning in for the performance and the fashion! As every year, we can expect a good show with out-of-this-world outfits from our out-of-this-world artists. First off, Beyonce was beaming in a one-shoulder fire red Lanvin dress (not her usual skin-tight gowns), which set off speculations of pregnancy! After her performance, she confirmed it by showing her bump!!! Now, at the VMAs, we can't expect the beauties without the wacks! 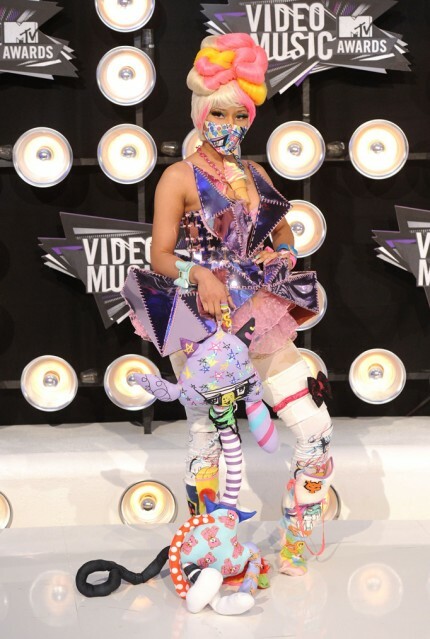 Speaking of which, the wackiest outfit goes to Nicki Minaj in a Harajuku Princess Warrior outfit. True to her personal style, she left with Best Hip Hop Video while dragging her two meter long stuffed animal purse. Selena Gomez in a Julien MacDonald frock was by far the best dressed (in my humble opinion)! The plunging neck, black lace trimming and legs, legs, legs!!! Watch out Bieber! I was surprised to see Katie Holmes, but she looks stunning and probably at her best within the last two years in an Azzedine Alaia halter dress. As for Kim, I don't really know what to say...the girl has flawless features and so much potential, but just doesn't deliver class...what can I say? Katy Perry was in kimono style mini dress by Versace on the red carpet. Then later changed into Christian Dior's head-to-toe runway look including an enormous yellow cube hat to accept her Best Video Music award. The two outfits are wild but I actually love them both on Katy! Lastly, but definitely not least: Lady Gaga performed as her male alter ego Jo Calderone. The attitue, the jerks, the cigarette behind one ear...every detail is to the tea. She is just a great performer!